Apple CEO Tim Cook met with a top Chinese official on Tuesday, who called on foreign companies to pay more attention to the care of their workers in the country, according to state-run media. The maker of the iconic iPad and iPhone devices is already facing criticism for alleged poor working conditions at the Chinese factories of its supplier Foxconn. Cook met with vice premier Li Keqiang, a day after he visited Beijing's mayor. Experts have said the meetings are meant to bolster ties with the Chinese government as the nation has become critical to Apple's manufacturing and product sales. During his meeting with Cook, Li said he hoped Apple and foreign firms would increase cooperation with China, and push for industrial development in the country's central and western regions, according to a Wednesday report by the Xinhua News Agency. Li, however, also hoped multinational companies would pay more concern to their Chinese workers. In response to criticism of the working conditions at Foxconn's plants in China, Apple has defended its policies and opened up its Chinese supplier factories for an internal audit by a labor rights group. 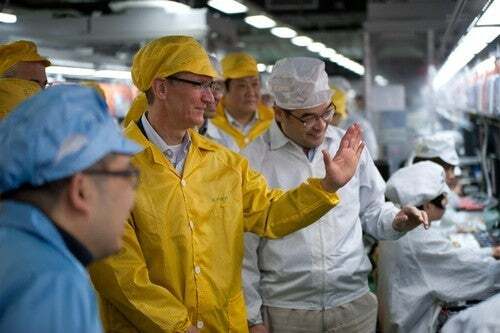 On Wednesday, Cook visited a Foxconn factory in China. 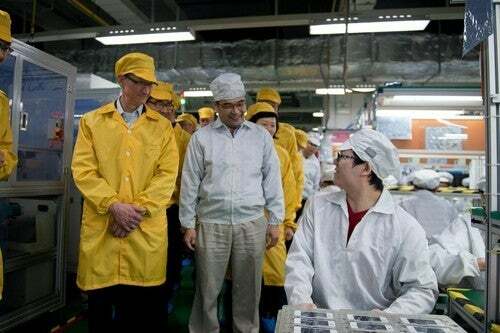 Apple released photos showing Cook at an iPhone production line at a newly built Foxconn manufacturing plant, which employs 120,000 people. This is Cook's first visit to China as Apple CEO. Before becoming company head, Cook visited the country in 2010 to investigate working conditions at Foxconn factories following a string of worker suicides. In China, Apple also faces a heated legal battle over the ownership of the iPad trademark, which threatens to ban sales of the company's iconic tablet in the country. A little-known Chinese firm called Proview acquired the iPad trademarks for China in 2001, but claims it never sold the trademark rights to Apple in 2009. A Chinese court is preparing to pass a judgement on the case. During Tuesday's meeting with China's vice premier, Li also called for fair competition and improved intellectual property protection among domestic and foreign businesses in the country. Cook said the company would deepen cooperation with China by running its business in a law-abiding manner. On Tuesday, a Proview representative said in a microblog post the company would carry on its trademark lawsuits against Apple for five or ten years, despite Cook's attempts to build up Chinese government support. "We firmly believe, that no matter what effect Cook's visit has on government relations, Apple's intellectual property infringement has already reached a final verdict, and that the company must receive the ultimate punishment according to Chinese law," wrote Li Su, the head of the consultancy group managing Proview, which is facing bankruptcy.